A Brief History of Veganism, friends from around the world, planting a tree in New Zealand, the first INVSOC potluck dinner - remember remember this first of November! If you cannot see the audio controls, listen/download the audio file here or, better yet, subscribe in iTunes to get each episode automagically! From Invercargill, New Zealand, bottom of the world, home of INVSOC, the southernmost Vegan Organisation in the world (possibly), Happy World Vegan Day! I've been holding back on this episode for the big day, and now, at I've begun recording for this podcast, can you hear the authentic, World Vegan Day-ness? While I wait for you Northern Hemisphere slackers to wake up and wipe the sleep out of your eyes, SOME OF US are enjoying World Vegan Day right now! I'll start the show, and finish off this episode at the end of World Vegan Day, New Zealand time. For this, most sacred 24 hour period of the year, the Invercargill Vegan Society is celebrating by planting a memorial tree, and having a group potluck dinner together. We have a small plaque, "planted on World Vegan Day, 1st November 2011, INVERCARGILL VEGAN SOCIETY", which will go with the New Zealand native Kauri tree. Kauri, K A U R I grow to become large and powerful trees. Ours will be planted in the Otepuni Gardens, surrounded by the Otepuni Stream, dragonflies, damselflies, ducks, wild rabbits and beer bottles. And according to its Wikipedia article, prostitutes and a general air of decay, although citation is needed. The Invercargill Vegan Society is ALSO having a group potluck dinner together, where we will no doubt ALL bring a packet of Oreo cookies and an empty stomach. I'll include that at the end of this episode. 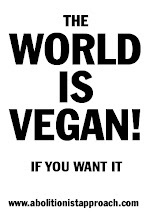 World Vegan Day, 2011, what a wonderful day! Its not difficult to be Vegan, personally, I think its as easy to be Vegan as not! Its a matter of buying Soy Milk instead of Stolen Milk…… You just have to decide "I want to be Vegan", to see yourself taking that first step, you just have to imagine. Sounds like Veganism to me! Ironically though, the guy who was all about imagining this and imagining that is *apparently* the only Beatle not to be Vegetarian or Vegan, huh, go figure! Imagining wont get us very far though, its going to take about six million dollars to get this thing up and running, and thats in 1974 USD too, thats probably a couple billion worthless American peso's these days, or about twenty Euro. Like other people named Steve, and fashion sense, Veganism has come a long way from the heady days of 1974 though, we've come a long way. Do you ever feel like our work promoting Veganism "…is never over…. ", like we're not getting anywhere? You do, REALLY? What the hell is wrong with you, geez, think positive man! Our activism is spreading The Good Word, and even being sampled by Rap artists as soon as our single is released! I'm lucky enough to be joined by some friends from around the world, thank you to everyone who shared their story for World Vegan Day, I really appreciate your help. Never take the work that we're doing for granted. We ARE making a difference, even just by being the only Vegan in your area, and then meeting another, and another and another….the movement is spreading out each day, each year there are many more Vegans than the one before. And like the state of making cyborg men in 1974, Veganism is STILL in the pioneer stage, of geiger counter arms, 60 miles per hour robot legs, and slow motion effects as far as the unaided, non zoom lens eye could see. Was a pleasure to be on the show. Should folk be interested, here's a link to our world vegan day show about veganism in politics, which interviews the 3 British vegan MPs and brings vegan lawmakers around the world together in one show. Yeahyeayeah, doubled up on the Colorado abolitionist love!! !